Well once again we've had a busy month & trade is definitely picking up as autumn ends & winter draws on ;-). One bit of good news is that the price of diesel continue to fall, with our current base price being 82p/ltr. This weekend 22nd/ 23rd Nov we're running from Oakgrove (Br 49 of the Macc), through to Whaley Bridge & Bugsworth, then back over Mon/Tues. Then Wed 26th to Fri 28th Nov we'll be delivering from Oakgrove (Br49 Macc) to Acton Bridge on the T&M via Congleton, Kidsgrove & Middlewich. 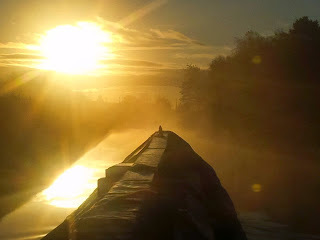 Sat 29th Nov to Mon 1st Dec:- Acton Bridge to Ellesmere Port via Middlewich, Nantwich & Chester. Mon 1st to Thurs 4th Dec:- Ellesmere Port to Oakgrove ( Br49 Macc) via Chester, Barbridge, Middlewich, Kidsgrove & Congleton. Sat 6th Dec to Tues 9th Dec:- Oakgrove (Br49 Macc) to Whaley Br & Bugsworth & return. Please note the above schedule is our plan, but is subject to change due to weather, traffic, customer volumes, good pubs or other factors outside our control. During the winter months, at times we struggle to stock sufficient fuels to meet ad-hoc demand, so to ensure a delivery please pre-order with a text or call to us on 07791345004.